Whinny Warmers® came about because we needed simple and nontoxic solutions to simple issues regarding our horse’s legs. In the winter, our older mare benefited from warm legs. It didn’t make sense that we could put a blanket on her, but the most valuable asset, her legs, were completely unprotected! She suffered badly from arthritis and we found that the socks changed her life and made it right. She was the inspiration and the beginning of Whinny Warmers®. It wasn’t such a large leap later that next summer to create the Summer Whinnys™ Silver for her. It wasn’t hard to see that each time she stomped to remove the biting insects from her legs that the percussion caused her pain. Silver Whinnys™ where the next natural step for us to make in order to help our horse have a better summer. Why we keep our sock design simple. We believe that straps, Velcro™, buckles or zippers can present hazards in leg designs. Silver Whinnys™ utilize a safe level of compression to keep them positioned on the leg. Making Whinny Warmers® very long allowed us to present owners with a safe options for their horses. For those who unfamiliar with wrapping, Whinny Warmers® are a safe choice in the winter and Silver Whinnys™ are a great choice in the summer. The Top and Bottom of Whinny Warmers® shown. Choose the right sock for the season. Silver Whinnys™ offer our horses nontoxic protection from biting flies. Silver Whinnys™ are all about nontoxic protection from biting flies and are composed of high quality, custom spun poly yarn. Polyester is the right choice of fiber for the equine environment. It does not act as a Petri dish in which bacteria and fungus can grow. We carefully stayed away from natural fibers. Fibers such as cotton invite and harbor bacteria, mold and fungus. Silver Whinnys™ were developed from the very beginning to bring the best fiber science forward into the equine world. Our fibers are carefully chosen for the properties that they offer to protect a leg. Moisture management fiber wicks moisture from the leg keeping the legs cool in the heat of summer. Another combined fiber in the yarn is embedded with silver and copper ions that will not wash out and will last the life of the socks. These elements are hard at work inhibiting the growth of bacteria, fungi and mold in the socks. Silver is well known for its properties of inhibiting the growth of bacteria. Copper inhibits the growth of fungus and mold. Silver Whinnys™ offer a clean environment around your horse’s legs. Our summer socks offer a light compression to the leg. Many have found that the socks are useful for protecting bandaging, helping to hold on poultices, and for alleviating edema in the legs. Go to “Testimonials” and read what our customers think. 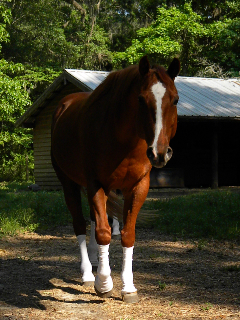 Sox For Horses, Inc. makes no claims that the socks will heal any conditions on equine legs. Whinny Warmers® are for cold weather, offering warmth to equine legs. Made from a wool blend yarn, this departs from our philosophy avoiding natural fiber, but you look to the purpose of each sock and nothing offers warmth like the combination of wool and acrylic. In order to help hold down the growth of bacteria, fungi and mold in the socks, Whinny Warmers® are lined with a layer of the same antimicrobial yarn used to make the Silver Whinnys™. Whinny Warmers® are very long socks that cover the leg from above the knee to the top of the hoof on the front legs, or up to the hock on the rear leg versions. As you know, because horsehair is slippery, it’s hard for anything to stay up a horse leg so we created a sock that is very long! When it slumps, the sock offers more warmth to that area of the leg it continues to cover, but seldom, depending on how much your horse is running around a pasture, do the socks slip down much below mid cannon. 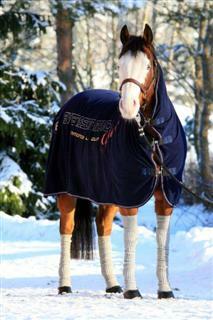 Most horses needing Whinny Warmers® are not running around when the winter temperatures are extreme. They are standing frozen to the ground in pain and until the socks begin to sink that warmth into the legs, until that horse begins to feel a constant period of warmth, it’s not going to have many periods of great activity. But watch out! When your horse’s has had a little time enjoying the circulation that warmth brings to the legs or the comfort that warmth brings to arthritis, you are going to find the socks slumping more and maybe, coming off in the pasture! Your horse is going to become a horse again. Celebrate and adjust the socks more often. You just made life good again for your horse. We have never had a horse injured because of losing a sock. Whinny Warmers® are well made. They are meant to last many winters. They are not expensive. Keep a pair handy and a pair on. Use Nikwax to help them repel water if your horse is out in the weather. Waterproof your Whinny Warmers® On washing and waterproofing your horses socks. Whinny Warmers® and Silver Whinnys™ are simple and functional. They designed to be safe for your horse, easy to put on, easy to take off, long lasting, washable, and affordable! Silver Whinnys™ and Whinny Warmers® are made in America! Completely! This is non-negotiable! Our knitting mill is an American business. The yarn spinners are all American! The socks are finished and wrapped in America. The labels on the socks are made in America. Our goal is to help horse owners better help their horses, but we also want American jobs to stay in America.